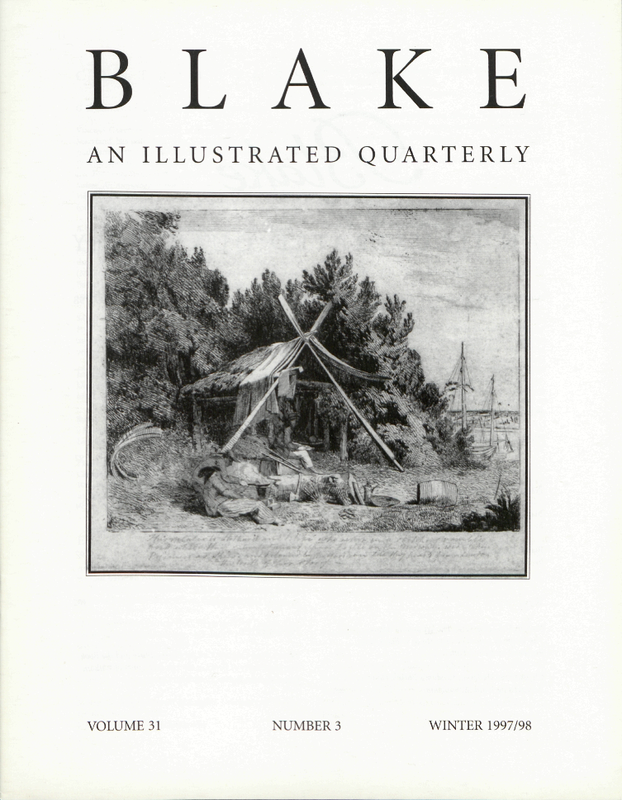 G. E. Bentley, Jr. is completing a biography of Blake. Vincent Carretta, Professor of English at the University of Maryland, has published “The Snarling Muse”: Verbal and Visual Satire from Pope to Churchill (1983), George III and the Satirists from Hogarth to Byron (1990), The Interesting Narrative and Other Writings of Olaudah Equiano (1995), Unchained Voices: An Anthology of Black Authors in the English-Speaking World of the Eighteenth Century (1996), and Letters of the Late Ignatius Sancho, an African (1998). A. Harris Fairbanks, Associate Professor of English at the University of Connecticut, has published on the romantics in PMLA, The Wordsworth Circle, and elsewhere and is the author of a rhetoric textbook/anthology, Fact, Value, Policy (McGraw-Hill, 1994). He is currently writing a book about Euclid’s geogetry, the game of chess, and parliamentary procedure. Sarah Joyce completed an MPhil study on Blake’s Milton A Poem in 1997 at University College, London, and has been involved in the London Blake Society for the last three or four years. Jennifer Davis Michael, Assistant Professor of English at the University of the South, is completing a book manuscript entitled Cities Not Yet Embodied:[e] Blake’s Urban Romanticism. Sheila A. Spector is completing a two-volume study, Blake as a Kabbalist, consisting of volume 1, The Development of Blake’s Language, and volume 2, The Development of Blake’s Myth. Frank A. Vaughan, Chairman, Department of English at Campbell University, is author of Again to the Life of Eternity: William Blake’s Illustrations to the Poems of Thomas Gray, Associated University Press, 1996. Cover illustration: Thomas Stothard’s etching of his own design representing the occasion when he, Blake, and another friend were arrested while on a sketching expedition on the Medway. Collection of Robert N. Essick.